Heavy duty construction and professional welding. 8 step metal cleaning and powder coat paint process. Snap together tool less assembly. Complete with all chains and hooks required. No Trees, No Posts, No Problem. 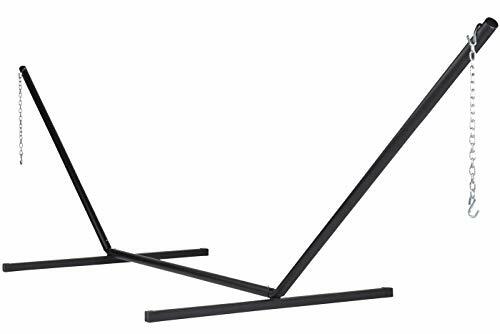 This Hammock stand is designed to hold any hammock that is under fifteen feet in length. It is easy to assemble in less than five minuets and designed to be portable so you can put your hammock just about anywhere. With a weight capacity of four hundred and fifty pounds you can feel confident it is strong enough to hold most people. It is constructed from cold rolled heavy gauge steel tubes and powder coat painted. It comes complete with all hooks and chains necessary to successfully hang your hammock.